KT on KMUZ: On-air with founders of the Latino Action Committee | Keizertimes | You think you know. To be sure, read Keizertimes. The Latino Action committee is planning to honor Latino scholars at McNary agin this year. Find out how to support the effort and the other actions the group has engaged in since starting up. In 2018, 18 graduating seniors at McNary High School strode into the next chapter of their lives with $150 scholarships from Keizer’s Latino Action Committee, a small group of local leaders looking to provide a megaphone to Latino voices. For City Councilor Roland Herrera, it was a moment worth savoring. Not simply because he’d been able to put a little good back into the world, but because of who else was in attendance – every single other city councilor. “That was the best I’d ever felt about Keizer coming together and, as a former city employee, it was really, really needed. We’re going to do better yet, but we’re working on it,” Herrera said. This year, the LAC will do it all again on May 9, and the group already has the backing of a $2,000 matching grant from a community donor. Herrera and Rev. 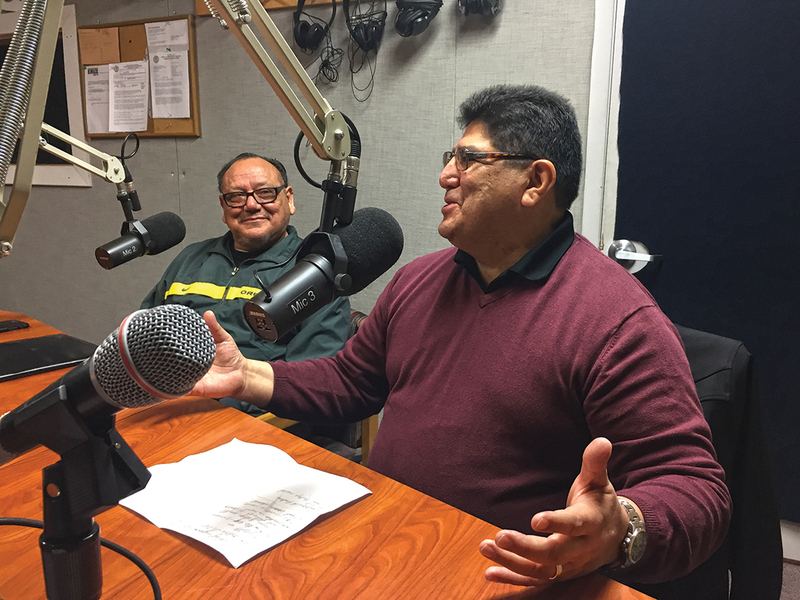 Jose Dominguez of Luz Del Valle joined me in the studio Friday, March 8, for an on-air interview to talk about the work of the LAC and their hopes for the future of the organization. You can listen to the whole segment on the Keizertimes Facebook page, but the conversation is one we wanted to preserve in print as well. The scholarships are one of the many ways that lift up the local Latino community, but the gesture fits into the goals of the LAC in other ways. “I spoke with Chief [John] Teague [of the Keizer Police Department] and expressed concern about the need for officers who are Latino or speak Spanish. He’s said there aren’t any candidates out there and we want to change that. How can students begin to engage in that. We believe that there are qualified, skilled and educated Latinos for these jobs,” Dominguez said. Making sure McNary students know that there is a community behind them that believes in them and wants them to succeed is the real goal of the scholarship program. That extends to the families of the graduates, who are sometimes the first in their family to achieve that milestone. “We want to help the families look at their son or daughter in a different way,” Dominguez said. The members of the LAC aren’t limiting their work to students, or even Latinos, either. Last year, when the Keizer City Council urged the leadership of Keizer United, a networking group for nonprofits, to find other ways to supply meals than a grant supplied by the city, the LAC provided lunch for the next month’s meeting. The LAC invited Teague and representatives of the Oregon State Police and Department of Public Safety Standards and Training to speak at Luz Del Valle in an effort to bridge the seeming divides that permeate relations between Latino communities and public safety organizations. When looking for a space to host the scholarship ceremony, the Keizer Civic Center was chosen specifically because it would mean attendees had the opportunity to change their view of what is done in the building. “People say that Latinos only visit city hall to pay their tickets or get their water turned back on,” Herrera joked. “We want to be a solution to the problems some of our parents had. They didn’t have the information. [It] is a blessing to know and move in both cultures. We’re able to clarify and give direction,” added Dominguez. During recent discussions about growth in Keizer, the city’s development director reached out to the LAC to involve Keizer’s Latino community. Together, the group set up bilingual meetings to receive more diverse input. The LAC hosted a celebration of Hispanic Heritage Month in September 2018, but Herrera wanted it to be more than just a party. More important, he said, is the effect of minority representation reflected in civic life. When a child can see themselves in a role, other opportunities come into focus. “When young Latinos have Latino teachers, they excel,” said Dominguez. For all the good the group is trying to do, Herrera said reading the applications of student scholars is bittersweet. Donations to the LAC scholarship fund can be sent to: LDV-LAC, 606 Dearborn Avenue .E., Keizer, OR, 97303. Those with concerns the LAC might be able help with or looking for information about the LAC can call 503-689-1652. LAC meetings are held at 9 a.m. the third Thursday of every month at Luz Del Valle.